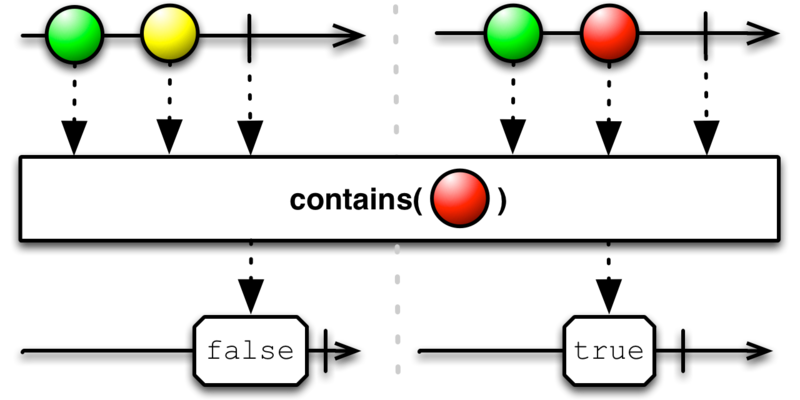 Pass the Contains operator a particular item, and the Observable it returns will emit true if that item is emitted by the source Observable, or false if the source Observable terminates without emitting that item. 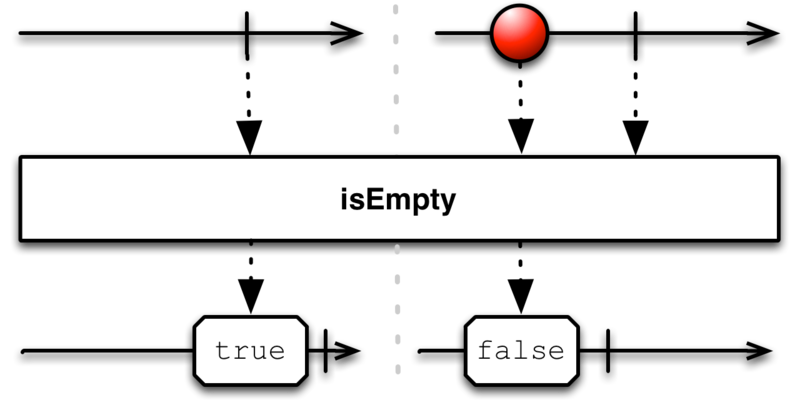 A related operator, IsEmpty returns an Observable that emits true if and only if the source Observable completes without emitting any items. It emits false if the source Observable emits an item. RxGroovy implements this operator as contains. It does not by default operate on any particular Scheduler. RxGroovy also implements the exists operator. It is similar to contains but tests items emitted by the source Observable against a predicate function you supply, rather than testing them for identity with a particular object. The Observable returned from exists will return true if the source Observable emits an item that satisfies your predicate function, and false if it completes without emitting such an item. It does not by default operate on any particular Scheduler. RxGroovy also implements the isEmpty operator. The Observable returned from isEmpty will return false if the source Observable emits an item, and true if it completes without emitting an item. RxJava implements this operator as contains. It does not by default operate on any particular Scheduler. RxJava also implements the exists operator. It is similar to contains but tests items emitted by the source Observable against a predicate function you supply, rather than testing them for identity with a particular object. The Observable returned from exists will return true if the source Observable emits an item that satisfies your predicate function, and false if it completes without emitting such an item. RxJava also implements the isEmpty operator. The Observable returned from isEmpty will return false if the source Observable emits an item, and true if it completes without emitting an item. The contains operator in RxJS takes an optional second parameter: a zero-based index into the source Observable’s sequence at which to start searching for the item. The indexOf operator in RxJS is similar to contains but rather than returning an Observable that emits true or false it returns an Observable that emits the index of the item in the source Observable sequence, or −1 if no such item was emitted. The indexOf operator takes an optional second parameter: a zero-based index into the source Observable’s sequence at which to start searching for the item. The index value that the resulting Observable emits will be relative to this start point, not to the beginning of the sequence. The findIndex operator in RxJS takes as its parameter a predicate function. It returns an Observable that emits either a single number — the zero-based index of the first item in the source Observable sequence that matches the predicate — or −1 if no such item matches. You can also pass an object to findIndex as an optional second parameter, and that object will be available to the predicate function as “this”. RxJS also implements the isEmpty operator. The Observable returned from isEmpty will return false if the source Observable emits an item, and true if it completes without emitting an item. RxPHP implements this operator as isEmpty. If the source Observable is empty it returns an Observable that emits true, otherwise it emits false. ReactiveX is a collection of open source projects. The content of this page is licensed under Creative Commons Attribution 3.0 License, and code samples are licensed under the BSD License.